Construction Studies is a very doable written exam for all students, so long as your answers are both practical and visual. Long-winded fancy paragraphs will grant you no marks if they don’t include labelled sketches, a practical approach and factual points! Studying all the information needed for the exam is not the difficult part of getting an H1 in this subject, it is understanding the exam paper, answering the questions with sketches and brief points, timing and knowing which questions to answer and which ones not to. In the guide below, Brian (awarded the national 1st place in Construction Studies Higher Level 2018 by the Techno Teachers Association!) 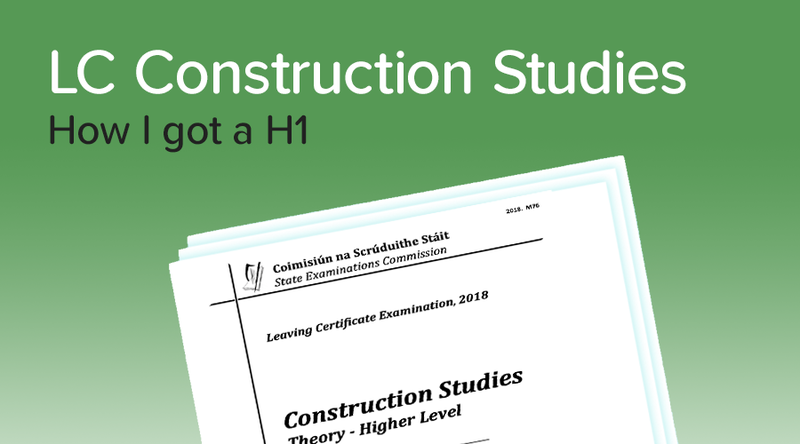 gives his tips on how to get a H1 in the Construction Studies exam. - Sketches do not need to be perfect in terms of shading and quality. Use a ruler and a pencil, make sure the sketch is tidy, large, labelled accurately and easy to understand. - No paragraph should be longer than half an A4 page. Every paragraph or set of bullet points should have a corresponding sketch so let the sketch do the talking. - It can be very enticing to spend an extra 5 minutes perfecting a drawing question, but it will not be worth it if you run out of time halfway through your last question. - Study the marking schemes in terms of the amount of the marks awarded for each part of a certain question as some parts can be worth much more than others. - If you are unsure about a question, don’t ramble on writing paragraphs without any substance, you will be rewarded no marks for this. Just write down what you know in bullet points and move on. I would recommend giving the first few drawings you got corrected by your teacher a quick look over before the exam and memorise the most important parts so that they're fresh in your brain. In the exam itself, try not to get bogged down on any specific detail, just try draw as much as you know as accurately as possible - do not rush! You will be rewarded for accurate work filled with information, even if the full question is not drawn. Remember to label everything and that practice makes perfect. I preferred answering questions that had definite answers using sketches and bullet points rather than writing time-consuming, long-winded paragraphs that have little substance. Because of this I prioritised the order of the questions that I was going to answer before the exam, first was Q.1 then Q.7, Q.5, Air-tightness Question, Services Question, Q.6, Q.10 and finally Q.3. Trust yourself. For example, if you have spent more time studying for Question 7 but a different question looks easier on the day of the exam, do not attempt the other question. It may look nicer, but you won’t have enough practice done for that question and will find yourself rambling on about something you’re not sure about. Don’t go over 35 minutes per question and finally, practice really does make perfect! To read all of Brian's tips on all parts of the paper, click here. Best of luck in the exam!